When examining the over-the-top gangsta posturing of mainstream hip-hop in the past 15 years, it's easy to see why some cats neglect to pay homage to one of the golden age's finest. This album single-handedly popularized hip-hop in all aspects of mainstream music, as it was the first #1 album in hip-hop history. Rick Rubin's uncanny mix of old school party beats over highly memorable rock samples is one of the most copied formulas in hip-hop history. It stands as some of Rubin's most memorable and excellent production ever. The production isn't the only reason this album was as wildly successful as it was. King Ad-Rock, MCA, and Mike D were three of the most relatable emcee's in history. They were a tight-knit crew of white party-loving fratboy-type dudes that appealed to the white suburbanite crowd on a grand scale - boosting their success to unrivaled numbers. Every cut on this 1986-classic is fire - forget about skip material. I remember listening the opening cut, "Rhymin & Stealin", for the first time ever, and being blown away by the Sabbath, Zeppelin & Clash samples. It seemed revolutionary from the get-go. My two favorites were always the Trouble Funk-inflicted "The New Style" & ridiculous stylings of "Posse in Effect". The undisputed classic singles are "Fight for Your Right" (who doesn't remember this video! 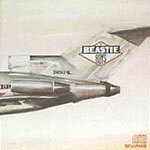 ), "Paul Revere", "Brass Monkey" & "Hold It Now, Hit It". Even the non-singles, such as "No Sleep till Brooklyn" & the goofy "Girls" were classic tracks, and the mashed-up samples in "Time to Get Ill" were phenomenal. Overall, if you're taking a pass on the Beastie Boys, you are missing out on an essential piece of hip-hop history, now matter how you slice it. This classic-filled gem may be one of the funnest rides in the history of rap. This was just the first of many outstanding albums from this unstoppable trio.